Since the independence over a partition between India and Pakistan in 1947, the relations between both the countries have not been normal. There had been numberless violations from Pakistan on 3323 KMs border touching with the India. We have witnessed 1965, 1971 followed by Kargil War. Kashmir has been divided between India and Pakistan since the two countries gained independence from British rule in 1947. Both claim the territory in its entirety. Rebel groups have for decades fought Indian soldiers demanding independence for the region or its merger with Pakistan. Tens of thousands of people, mostly civilians, have died in the fighting and both claim the territory in its entirety. In 1947-48 India and Pakistan fought their first war over Jammu and Kashmir. Under the United Nations' supervision, they agreed to a ceasefire along a line which left one-third of the state - comprising what Pakistan calls Azad Jammu and Kashmir, and the Northern Areas administered by Pakistan and two-thirds, Jammu, Ladakh and the Kashmir Valley, administered by India. In 1972, under the terms of the Simla agreement, the ceasefire line was renamed the Line of Control. Although India claims that the entire state is part of India, it has been prepared to accept the Line of Control as the international border, with some possible modifications. Both the US and the UK have also favoured turning the Line of Control into an internationally-recognized frontier. But Pakistan has consistently refused to accept the Line of Control as the border since the predominantly Muslim Kashmir Valley would remain as part of India. Formalizing the status quo also does not take account of the aspirations of those Kashmiris who have been fighting since 1989 for independence for the whole or part of the state. Another scenario which is creating hindrance to the solution of Kashmir is that Pakistan has consistently favoured this as the best solution to the dispute. In view of the state's majority Muslim population, it believes that it would vote to become part of Pakistan. However a single plebiscite held in a region which comprises peoples that are culturally, religiously and ethnically diverse, would create disaffected minorities. The Hindus of Jammu, and the Buddhists of Ladakh have never shown any desire to join Pakistan and would protest at the outcome. 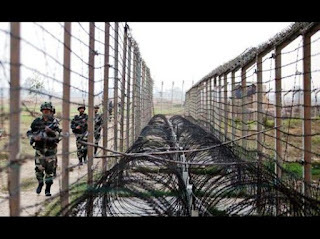 Now again, the skirmish came two days after India claimed it had carried out Surgical Strikes across the heavily militarized Line of Control (LoC), the de facto border in the disputed territory, on what it called "terrorist" targets several kilometres inside Pakistan-controlled Kashmir. The operation Surgical Attack was the need of the hour as all meetings between the two countries during 69 years of independence have not brought fruitful results. Surgical Attack by the Indian Army claiming to have killed 38 terrorists by entering into the Pakistan Occupied Kashmir (PoK), have boosted the morale both of the Army and the people of India. But at the same time, there is also a tense and war like situation in both the countries. Surgical Attack was a warning to the other end with the attack on the terrorists only without harming the common men or loss to the country which was later on informed formally to the Pakistan government. But as to how the Pakistan take it depends upon him as the pressure of local politics have increased on Nawaz Sharif and at present, war like situation could be seen. With the orders of evacuation of villages falling within 10 KMs of the border belt by the Indian Government in Rajasthan and Punjab and scenario building up across the fence, is also an indication of worrisome for the residents of the area. The villagers have been witnessing activities of Pakistan military across the border during day time. However, still they prefer to keep their light on, but they had been keeping their lights switched off so that nobody could watch their activities. According to some villagers Pakistan have deployed rangers and army in good strength and has also installed tanks and missiles near zero line near Hussainwala in Ganda Singh Wala side of Pakistan. People now hardly hear sound of Namaz from the other side of the border from Friday which was regular feature earlier. So far, the situation is normal in Punjab, Rajasthan, Gujrat barring Jammu and Kashmir where the situation is tense since the last Uri attack and disturbances which compelled the government of impose curfew for more than two months. Those who live near the border line, know that in the event of war between two countries, the loss of life, damage of property are part of the action. The memories of earlier wars are still afresh in their mind especial the scenes of 1947 when they have to leave their belongings in Pakistan while coming to India. In fact, it has been a greatest blunder at the time, to divide India and Pakistan on caste basis. With further confrontation between the countries could lead to more worse situation in the coming days and only with this feeling, the problem should be tried to be solved through serious dialogues between the leaders of both the countries. International community too is worried about the opening of war. US has already advised to both the countries to deal with the situation very patiently. There is no place for conventional wars now in this high tech era which are more irritating, worrying and only end with destruction. With the opening of war, only the hate crops up and the only ultimate goal becomes to teach a lesson to the other side by putting in the trouble beyond one’s expectations. Not only the common man is affected but the whole economy of the country is shattered when there is imbalance in demand and supply. Nobody would advocate the war after seeing the availability of sophisticated nuclear weapons available in the international market which could destroy any party of the land at a reasonable distance while operating from home land itself. Frankly speaking, wars are not the solution to any problems like suicide rather fighting with the circumstances in some other way as these are always followed by disasters and the ultimate sufferer are the residents who are uprooted from the routine life. Aftermath of the war have so deep impact that it takes years to rehabilitate to come to normal life after the war. War of words with prejudice statements like the Imran Khan’s description of Indian Prime Minister as a ‘prejudiced extremists” at one of rally too needs to be checked and condemned. It is not matter of worry that in the event of any internal and external disturbances, the share market graph comes down considerably. Anyhow, keeping aside as to whether India or Pakistan is capable to attack more forcefully with the latest technology weapons, there is a need to concentrate to normalize the atmosphere by thinking above ego and unnecessary loss of human lives. The best solution to the Kashmir conflict is just a status-quo. India gets keeps its portion of Kashmir and Pakistan keeps its portion and does not cause problems. Any misadventure by Pakistan needs to be punished by incorporating all of PoK back into Indian- Kashmir and this can be done. Keeping all these factors in view, there is still need to ‘Lock the LoC with Love Key” by tackling the issue of terrorism seriously and with cooperation of each other.